How do I buy a Wenonah Canoe? 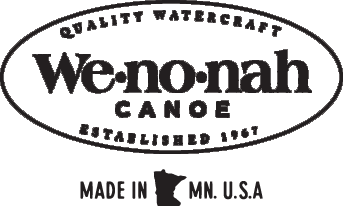 The only way to purchase a Wenonah Canoe is through an authorized dealer. We care about customers receiving their canoes in one piece, so we will only ship via our own trucks and drivers directly to dealers. There may not be a dealer right in your area, but there’s likely one not too far away who will work with you. Check the Retailers link on this site and enter your city or zip code to find the nearest authorized dealer. Where can I obtain replacement parts for my canoe? What is the max capacity for a particular model? Many canoe makers publish specific weight capacities for their hulls. These are highly misleading for many reasons: 1. Even if you know how much weight you've put into the canoe, water in the bilge rapidly increases the load by an unknown amount. 2. If loaded anywhere near its claimed limit, a canoe may not be overloaded officially, but it will handle very poorly. 3. Waves or strong current call for an increased safety margin, hence less load. 4. Paddlers' skills play a major role in what weight a canoe can transport safely. We don't print specific figures. Rather we say our hulls have reserve capacity for their intended use. A Heron or Fisherman is for shorter day-trips. A Rogue, Adirondack, Aurora, Kingfisher, or Escapade will take two typical adults with moderate gear. A Spirit, Escape, Boundary Waters or Cascade is ment for two adults with lots of gear. The Minnesota II, and Champlain have a bit more capacity, while the Minnesota 3, and Itasca will carry three to four adults and lots of gear in most situations. If you're worried about the capacity of any model (made by us or by anyone), a published figure is not a reliable guide. Load the hull with the intended weight and test it. If the canoe is overloaded, a test will reveal it better than any published figure could. Can gel coat be added to an Ultra-light hull? Yes and there is no additional charge. However, the final weight will be increased by 6-8 lbs. depending on the model of canoe. Where can I try the models that interest me? To test paddle, please visit our Dealer Locator by clicking on the "Where to Buy" to locate the nearest authorized dealer. If they do not have the model you are seeking to paddle, they may be able to arrange a paddle at a later date once one becomes available. What is covered by the limited lifetime warranty? If you are the original owner of the canoe, the warranty covers manufacture defects. It does not include normal wear and tear that occurs naturally over time. For example, a seat bracket failure after 20 years is normal wear-and-tear; a seat bracket failure after 20 days is a defect. I don’t have a dealer within several hours from my location, can I buy a canoe direct? We apologize for not having a dealer within a convenient distance, however, if you contact your nearest dealer, they often can help in accommodating you in obtaining a Wenonah canoe. Where can I find my canoe’s serial number? Your canoe’s serial number will be found on the stern (back) of your canoe on the starboard (right) side. It will likely be on a metal plate on the outside of your canoe or possibly engraved into the gunwales. The serial number should start with MFP to confirm it is a Wenonah Canoe. The first three letters MFP indicate you have a Wenonah canoe. The next two letters (or numbers) note the model of the canoe. The next three digits are the unique portion of your number that identifies your specific canoe. This is followed by a letter which represents the month of production. The last three digits are the production and model year. When I order a yoke, thwart, or bench seat is it automatically cut to fit my canoe? No, it is left long so you can cut it to custom fit your specific canoe. All canoes are hand-made, so the fit of the part in your canoe may not be the same as the fit in a canoe of the same model. While the canoe builders have general guidelines to follow, each canoe is unique. No, we do not do refurbishing here. We fix damaged canoes, but regular maintenance is up to the canoe owner. How much is my canoe worth? Your older Wenonah canoe is worth as much as someone will pay for it. There is no “blue book” available for canoes. What should I use to clean/ wax/ protect my canoe? To clean your canoe, the simplest and easiest way would be to use a mild soap (like Dawn dish soap) and water. For protecting your canoe we advise using our SPF 50 Boat Protection or a marine or car liquid or paste wax. How can I find the right canoe for me? Your authorized Wenonah dealer is your best help in finding the canoe that will fit your needs. No one canoe can do everything you want, so you need to look at how many paddlers will be primary users of your canoe (one, two or more), how big are the paddlers, what kind of water you’ll be paddling (flat water lakes or ponds, small rivers, white water rivers, big waters with large waves or surf), and the length of time you’ll paddle (short day, a few days, a few weeks, longer). Once you can answer these questions, the right canoe is easy to discover. Generally, paddle length is determined by height and the paddler’s style of paddling. An easy way to measure in the field is to place the grip of the paddle between your legs while sitting. Next, make note of where the shoulder of the blade (the point where the blade meets the shaft) hits you. The shoulder on a straight shaft should be at your forehead; the shoulder on a bent shaft should be at your nose. If you are a more aggressive paddler and dig deeper, you will use a little shorter paddle than a paddler who is less aggressive in their methods. Bow – the front of the canoe Stern – the back of the canoe Port – the left side of the canoe, if facing the bow Starboard – The right side of the canoe, if facing the bow Gunwales – the upper edges of your canoe, generally protected with strips of aluminum, wood or vinyl (depending on the material used to build your canoe) Yoke – the curved center support in your canoe, perpendicular to the gunwales, shaped to rest on your shoulders during portaging. Handles – the short supports on either end of the canoe, just behind the end caps Thwart - other supports that run perpendicular to the gunwales, usually forward or aft of center. If you do feel that you have a warranty claim, you would want to contact your Wenonah Canoe dealer (or the nearest Wenonah dealer if your store is no longer in business) to file claim. They will need the serial number from your canoe plus pictures of the defect. They will assess the defect and contact Wenonah if necessary; there is no need for you to do so. How to store my canoe? Your canoe should be ideally stored indoors, resting on its gunwales, supported in at least two locations to evenly distribute the weight of the canoe. You can also suspend a canoe from the ceiling right side up with ropes going under the bottom in at least two places. Do not hang it from its gunwales, yoke, thwarts or handles. Do not store sideways on hooks. If you must store it outdoors, make sure it is protected with an awning for sun protection and to prevent snow or ice from piling up on it and deforming the hull. You may use a tarp for sun protection as long as it is breathable material to reduce the chance of mold, mildew or discoloration. Do you have all of your models on display at Wenonah Canoe? Wenonah Canoe has a small showroom, but generally we only have one or two canoes on display. We are not set up for retail sales, and would only have a model on site if we are contracted to build one. What specific catalyst should I buy to use in the Gel Coat Repair or Fiberglass Repair Kits? The catalyst used with our resin is Methyl Ethyl Ketone Peroxide, and can be found anywhere fiberglass repair supplies are found. I’ve heard Kevlar canoes are delicate, is this true? The Kevlar material used in our canoes is NOT fragile. If the material were fragile, we would not be using it. Kevlar offers the perfect combination of weight savings and durability. That being said, the variety of Kevlar used by Wenonah Canoe does NOT make your canoe bullet-proof!